Sotheby’s auction house traditionally likes to use their Hong Kong auction as a forum to display very interesting and impressive fancy color diamonds, which tradition they will continue to uphold on October 3rd. From vivid yellow diamonds to pinks and rare blue diamonds, most of the gems sold will show strong prices, despite the fact that global financial markets are still questionable due to political uncertainties ranging from Iran to North Korea. Let’s review some of the top lots of fancy color diamonds offered beginning from the highest valued. 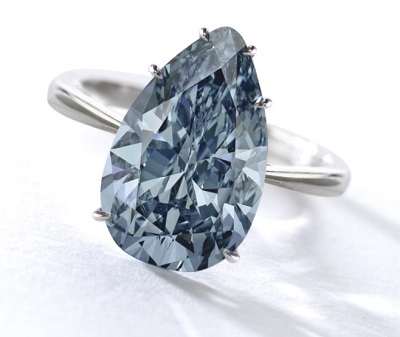 The top lot at this auction is a very rare and important Fancy Deep Blue diamond. It is a 5.14 carat Fancy Deep Blue pear shaped SI1 diamond that is estimated to sell between $7 million and $9.6 million, or $1.37 million to $1.87 million per carat. If the diamond sells at the high end of the value range or above, it will break the record price paid per carat for any Fancy Deep Blue diamond. The previous record is held by the 5.30 carat Fancy Deep Blue diamond that was sold at Bonham’s London on April 24, 2013 to Graff Diamonds for $1.792 million per carat. The second highest valued jewelry of the evening is a pair of earrings. They feature a 5.21 carat and a 5.01 carat Fancy Pink pear shaped diamond each, one with an Internally Flawless clarity and the other with VS1 clarity. 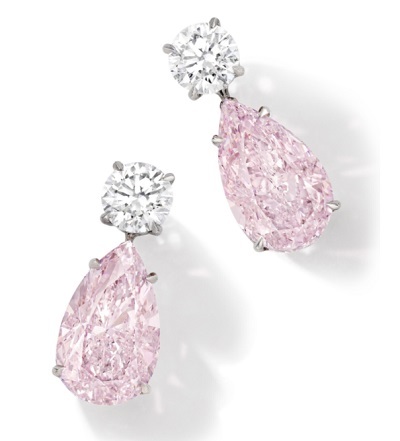 The pair is valued at $3.8 million to $5.1 million in total, or $375k to $500k per carat. If it sells for $5.5 million total, it will break the world record for the highest per carat paid for a Fancy Pink diamond (in total weight). The previous record is held by the 18.51 carat Fancy Pink diamond that was sold just last year on May 17, 2016 at a Sotheby’s Geneva auction. 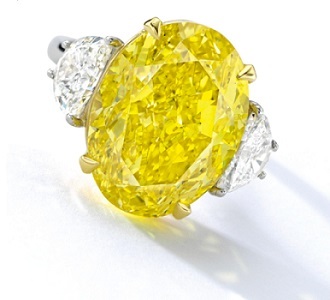 The next highest valued lot is an exquisite Fancy Vivid Yellow diamond. It weighs 20.03 carats and has an Internally Flawless clarity and an emerald cut. The diamond is valued at $2.04 million to $2.56 million, or $102k to $128k per carat. At these valuations, it will not break any record, but it demonstrates the strength that exceptional colors maintain at any given market conditions. 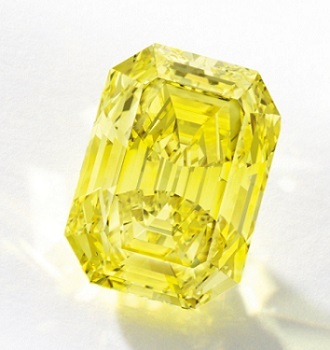 Following is another rare Fancy Vivid Yellow diamond. It weighs 11.46 carats and has an oval shape and VVS1 clarity. 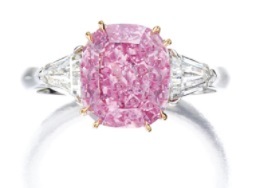 The valuation stands at $959k to $1.15 million, or $84k to $100k per carat. This diamond only reinforces how the strength of color will dictate the value of a diamond. There are many Fancy Vivid Yellow diamonds in the market in this weight and clarity category, yet their prices are much lower than the price that this diamond will attain. The next lot in our analysis is a 21.22 carat Fancy Vivid Yellow Internally Flawless diamond cut in a cut-cornered square modified brilliant cut shape. 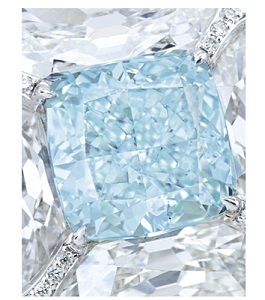 It is valued between $869k and $959k, or $41k to $45k per carat. 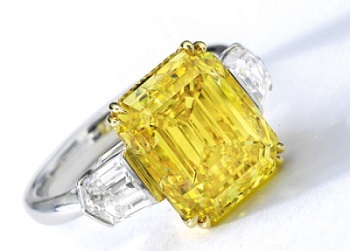 If we compare it to the 20.03 carat Fancy Vivid Yellow diamond above, the valuations seem conflicting. How can this be? As the adage goes, in fancy color diamonds, the color is king! Despite the fact that both diamonds are above 20 carats in weight, both are Fancy Vivid Yellow and both have Internally Flawless clarities, the 20.03 is valued more than twice (and three times) the value per carat of this diamond. This fact surely must mean that the color in this diamond is a weak Fancy Vivid Yellow, closer to a strong Fancy Intense Yellow. This fact is a very important reminder. An investor must pay close attention and always bring along an expert in fancy color diamonds to guide their acquisition. An investor should be willing and happy to pay a fee to the expert, as avoiding the expert fee may end up costing the investor a lot more, should they acquire a diamond at the wrong value given their lack of diamond price knowledge. 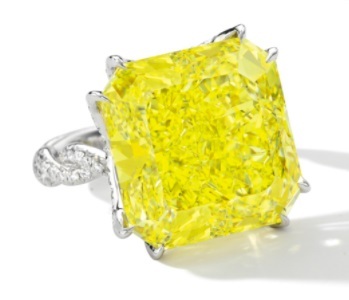 The next item in our discussion is also a Fancy Vivid Yellow diamond. It weighs 6.55 carats and has VS2 clarity and am emerald cut. It is valued at $793k to $1.02 million, or $121k to $156k per carat. Based on the valuation, we can surely assume that the color is extremely strong, rare and probably a Zimmi yellow, the most saturated yellow color possible. Our next lot in value is a 2.86 carat Fancy Vivid Purplish Pink modified cushion shaped diamond with I2 clarity. It is valued at $767k to $1.02 million, or $268k to $358k per carat. 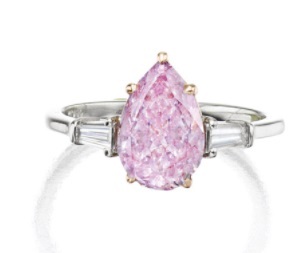 It is not often that we see a Fancy Vivid Purplish Pink diamond offered at auction in this weight (2-3 carats). Interestingly, this category in weight is quite in demand in current markets, and there are not so many diamonds available to satisfy. According to the valuation, the color might be weak enough to be considered a Fancy Intense Pink diamond rather than Fancy Vivid, and therefore the value would make sense. 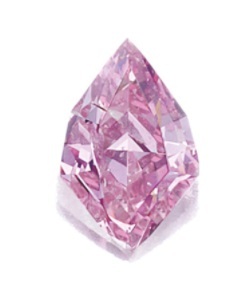 A strong Fancy Vivid Purplish Pink diamond would command a value at least twice as much. The next item is an extremely rare diamond color, Fancy Intense Purple. It intrigues collectors and investors, and this diamond is extra unique because it is extremely rare to find an unmodified, clean, Intense Purple diamond like this one. This particular one is a 1.99 carat Fancy Intense Purple pear shaped diamond. 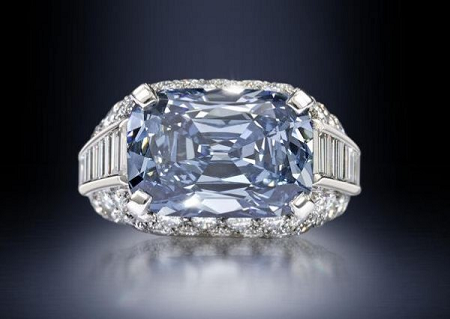 It is valued at a final price of $537k to $703k, or $270k to $353k per carat. This is definitely an asset that a collector would want to acquire. It is extremely rare for such a pure color to be found, and an extraordinarily unique item for a collection. We might see a sale price well above the auction house’s estimate. Another exceptional color diamond for a collector is the 3.05 carat Fancy Blue-Green VS2 modified cushion shaped diamond. It is valued to sell at a price between $384k and $511k, or $126k to $168k per carat. This diamond is an exquisite example of exceptional color balance between green and blue. In most cases, we see a bluish green or a greenish blue. Its unique balance makes it fascinating and rare. This 2.08 carat Fancy Vivid Purplish Pink diamond is valued to sell from $192k to $256k, or $92k to $123k per carat. Why would a diamond with such excellent characteristics be valued so low? It is probably because it was cut into a weird shape, and probably also has a very weak color, possibly even unattractive. This will have to be made into a piece of jewelry in order to bring out the color and make it truly special. It was probably a re-cut from a Fancy Intense diamond, and thus wound up in this shape. 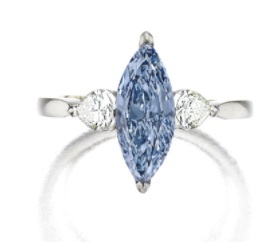 The second blue diamond to appear at this auction is a 1.21 carat Fancy Intense Blue VVS2 marquise shaped diamond. It is valued quite low, at $192k to $256k or $158k to $211k per carat. It will be very interesting to see the end result, and by how much more it ends up selling. Don’t hold me to my word, but it should sell for twice as much. I am certain that prices for fancy color diamonds will be maintained at a high value, mostly due to uncertainties in the financial markets and current geo-political worldwide. Investors want to hold onto real assets as part of their holdings in times like these, and this is ultimately reflected in the diamond prices in the market. Given the current state of the market, I feel strongly that the auction house prices will indeed be met. Got any questions about the diamond valuations, the market, or investing in diamonds? Ask in the comments or contact us!